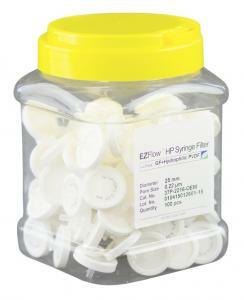 Next Day Science offers EZFlow Syringe Filters, in 13mm, 25mm, and 33mm sizes, for use for pre-filtration, clarification, or fine particulate removal. Available in a variety of filter membrane materials, the membranes are reinforced with polypropylene houses and are available for both sterile and non-sterile applications. See product description for more detailed information or call customer service at 866-650-0314 for further questions. The size of the filter depends on the volume of sample you need to filter. 33 mm filters are the largest we stock. They are ideal for large sample volumes. The area across the filter is wider, allowing for faster filtration than the smaller sizes. 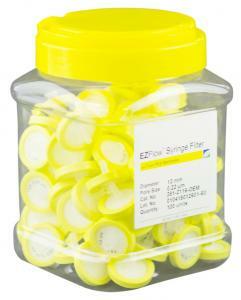 25 mm filters are ideal for high throughput labs. They are an economical choice for large quantity filtration requirements. 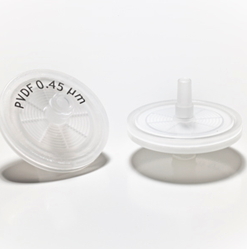 Our smallest filters are 13 mm and can be used in most applications for volumes that are 1-10 mL. Throughput refers to the amount of particles a filter can hold before its membrane clogs and impacts filtration. A high throughput will filter a greater amount of particle before it clogs and is ideal for larger volumes. A lower throughput may be acceptable in cases of minimal volume to be filtered. What are the advantages of 2-in-1 filters? 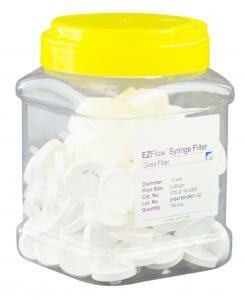 2-in-1 filters which are filters containing a pre-filter are ideal for difficult-to-filter samples. The pre-filter holds coarse particles without requiring extra force, enabling higher throughput. These double purpose filters provide cost savings when compared to purchasing the components individually, and time savings by eliminating the requirement for a second step with a separate filter. How do I determine the required pore size? Choice of pore size depends on the size or the particle you wish to filter or retain, and if any sample loss is acceptable. In cases where some sample loss is acceptable, you may choose a pore size that is the same as the molecular weight of the solute. If no loss is desired, choose a pore size that is less than the molecular weight of the solute. What is the difference between PVDF and PES membrane filters? 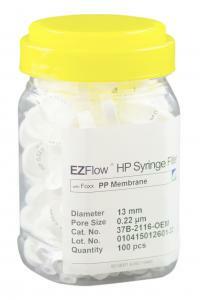 PVDF is polyvinylidene fluoride and has been traditionally used for filtering aqueous solutions containing viruses. 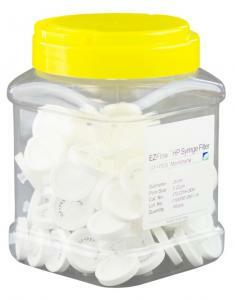 PES is made of polyethersulfone and is a newer membrane filter. Both filter viruses equally well, but the PES allows for higher filtration rate and clogs more slowly.